We update this page from time to time with important news including weather updates in severe weather conditions that may cause the shop to be closed. We tend to put more light-hearted news on our Facebook page which can be accessed by clicking the social button on the header menu. 2019 Kona Cotton Solids Colour of the Year. This new colour is now in the shop and Darren has just added it to the end of Kona Cotton Solids Page 6 - product code KCS344. This increases our range of Kona Solids to 344 colours. 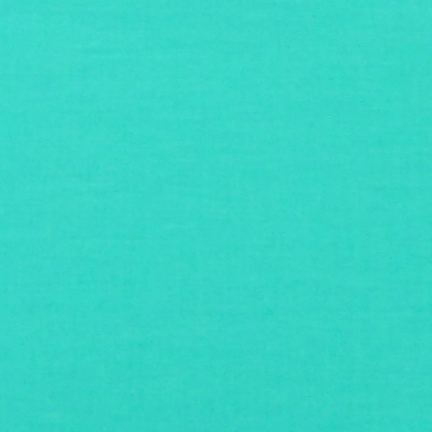 Called Splash, it is a nice, bright, turquoise colour. Solution to website links to PDF files not opening when using Firefox as your browser. 1 Click the menu button (usually 3 horizontal bars, top right of screen) and choose Options. 2 Scroll down the list to the Applications panel. 3 Find Portable Document Format (PDF) in the list and click on it to select it. 4 Switch it to "Use Adobe Acrobat in Firefox". 2018 Kona Cotton Solids Colour of the Year. This new colour is now in the shop and Darren has just added it to the end of Kona Cotton Solids Page 6 - product code KCS343. 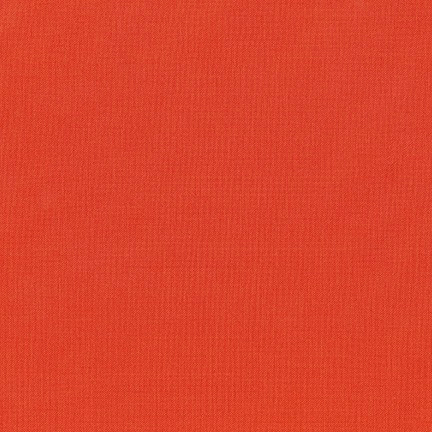 It is a nice, rich, orange colour. Darren has redesigned our website to make it more user friendly. There is now a permanent menu bar across the top of every page so there's no need to scroll the page to access the menu. There are also buttons at the bottom of the pages to help navigate quickly back to the top or to the previous or next pages. The fabric images are slightly larger and the Kona Cotton Solids have been split onto 6 pages to match the colour card. You may find that you have some old style pages stored in your cache. If one of these loads, just refresh it and it should change to the new style. Please let us know if you spot any glitches - it's very difficult to get everything working perfectly. We now stock all 342 colours of these popular plain fabrics. We will have the 2018 feature colour soon. It was nice to see some of the Quilters' Guild's Collection of historic quilts on display at the Festival of Quilts this weekend, especially the Mariner's Compass Coverlet, which inspired a new range of fabrics from Marcus called Elizabeth's Dowry. We are the first UK shop to have the full collection. Click on the photo to view the web page. Quiltessential is now 10 years old. Thank you to all our customers who make it all worthwhile. British Quilt and Stitch Village - Uttoxeter. We would like to congratulate Vivien Finch for winning a prize at the show. Vivien is one of our friends, regular customers and workshop tutors. 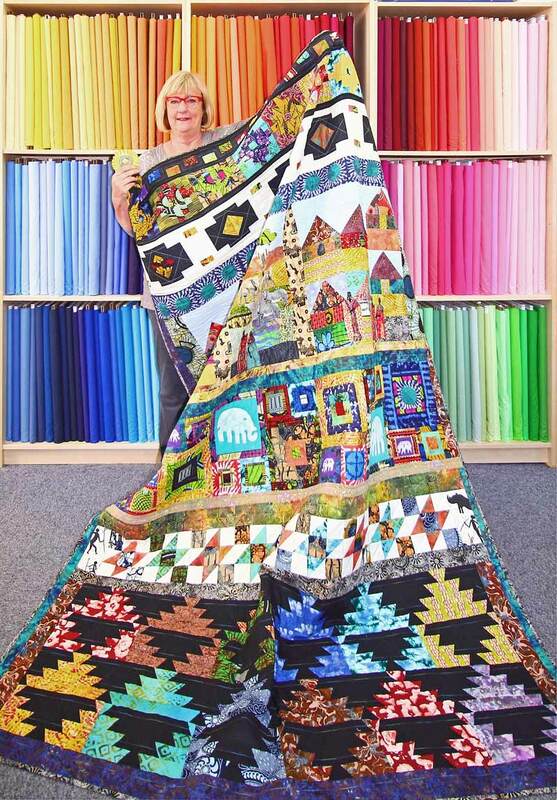 She has been quilting for 40 years and is presently the President of the Quilters' Guild. She is very modest about her work though and doesn't normally enter competitions. Ann persuaded her to enter Under African Skies and she was thrilled to have won third place - her first rosette! The quilt was made with batiks and African wax prints which she had left over from a charity quilt she made 10 years ago. The African fabrics were donated by Magie Relph of the African fabric Shop. 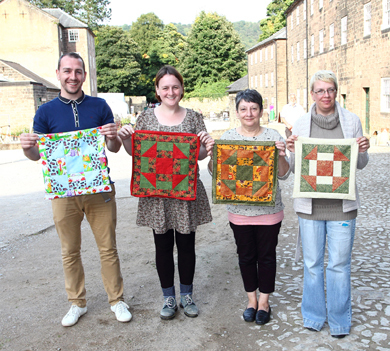 The design of the quilt was inspired by a workshop run by Jan Hassard which Vivien attended. 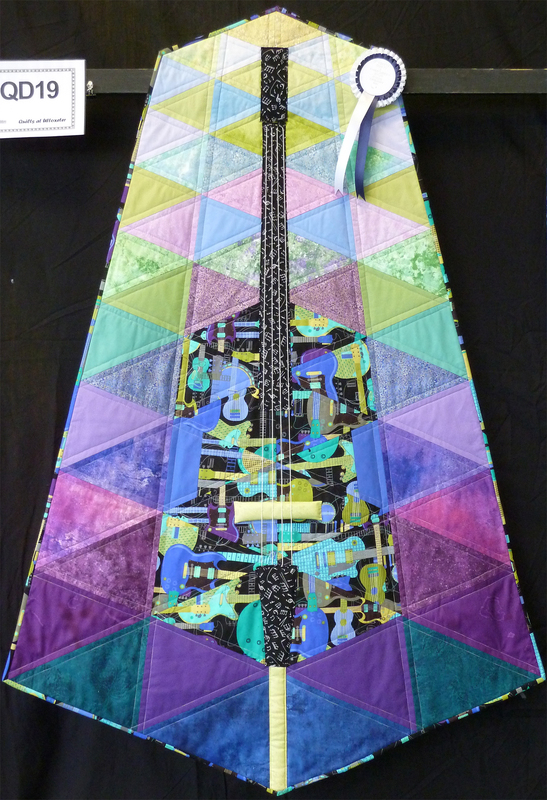 Quiltessential Sponsored 3D Category at Uttoxeter Quilt & Stitch Village. Congratulations to Birgit Schueller from Germany who won this category with her stunning entry: Chocolate Orange Cocktail, a 3-piece cocktail party outfit with each piece made in a different colour and all embellished with exquisite stitching and curved flying geese. This month we had our first male attendee in a beginners class. We taught two sisters, their brother and Mum how to do patchwork. It was Mum's birthday treat and was kept as a complete surprise until she got to the shop. Ben's choice of fabrics was a bit 'unusual' but his stitching was very accurate. They all seemed to enjoy the experience and left with their own, unique cushion cover, a new hobby perhaps and, hopefully, some good memories of the special day. Success at festival of Quilts. We were thrilled that our joint entry in the 2 person category was awarded a 'Highly Commended'. It is 2.5m long and is called Logorhythmic because it is based on our logo design and has a rhythmic sense of movement as the small blocks meander around the large blocks. It was designed by Darren over 7 years ago when he designed the Quiltessential logo and made by both Ann and Darren for this show. We have UFO designs as well as quilts! This one finally reached a successful conclusion. It has foundation pieced blocks made with bright coloured, plain fabrics contrasting with a black background fabric. Darren did most of the cutting and a lot of the block making. The blocks were then quilted by Ann with contrasting thread and joined together, including the borders, using our quilt-as-you-go technique. A reduced size version of this design is available as a pattern exclusively from Quiltessential. 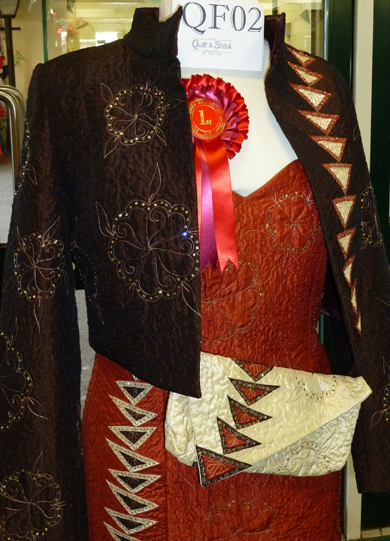 Quiltessential Students’ Exhibition at Uttoxeter Embroidery & Quilt Show. 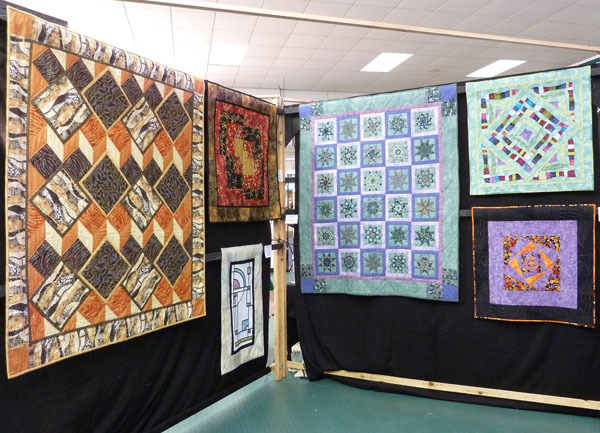 As well as the competition quilts on display at the Uttoxeter show, there was a small exhibition, organised by us, which featured 22 quilts that had been started by students attending our workshops. We received many positive comments from visitors to the show who said how much they liked our small exhibition. Success at Uttoxeter Quilt Show. Darren entered a quilt in the Challenge category and got a second place! This was quite an achievement as it was only his third completed quilt and his second competition entry. Every entrant was given 75cm of the challenge fabric - the bright, multi-coloured fabric covered with guitars, banjos etc, which had to be used in the quilt, together with the theme: Rhythm & Blues. Darren liked the fabric so decided to have a go. He created his design based on the double bass - an instrument he likes very much and one which forms the rhythm section of many traditional R & B bands. 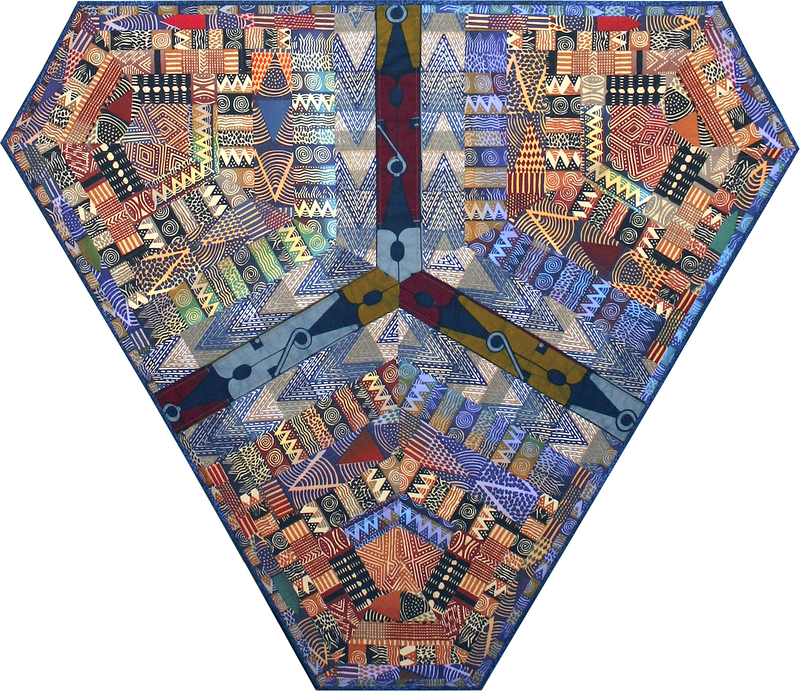 The geometric design of the quilt is derived from the shape of the bass. The triangular pieces were cut using templates and foundation pieced. The quilt was finished with appliqued embelishments and strings. Darren was very pleased to get a rosette and even more pleased when several people told him he should have won. Darren's first serious attempt at making a quilt resulted from being press ganged into a group challenge instigated by our friend Magie Relph from the African Fabric Shop. Along with Ann, Magie's husband Bob, Janice and David Gunner and several others, we were given a piece of African wax print fabric with a large clothes peg design and a title which was a pun of something familiar. Darren's title was '3 Little Pegs'. Darren used the 3 as the inspiration to design a triangular shaped quilt made from foundation pieced log cabin blocks. He used the peg fabric as the feature ‘spokes’ and bought some African wax print fabrics with linear designs from the African Fabric Shop and fussy cut them all to accentuate the block symmetry. He entered the quilt at Festival of Quilts and was very pleased with the judges’ comments. One of the 2 judges marked his quilt as excellent in all 8 categories, which is amazing for a first attempt!